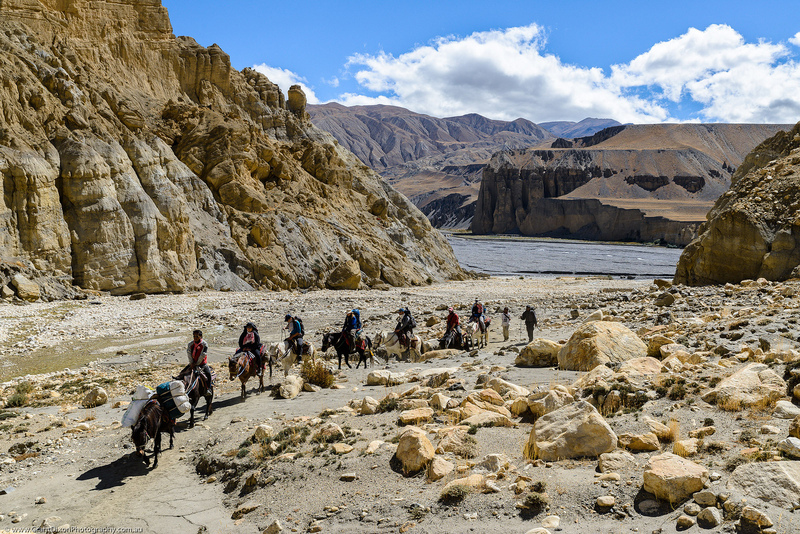 The Upper Mustang Trek is like stepping into a time capsule. 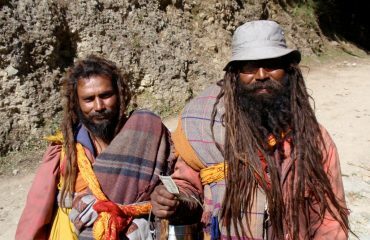 Because this route takes you to the former Kingdom of Lo, a remote and isolated region of the Nepalese Himalayas. 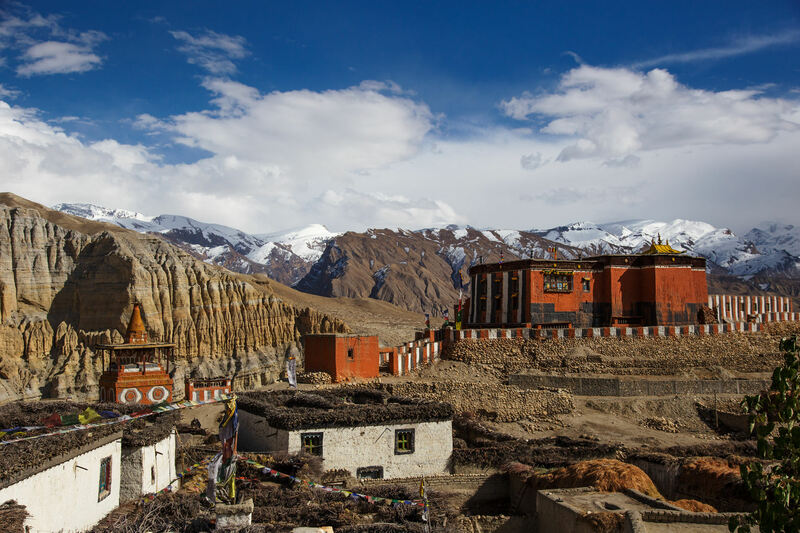 Since Upper Mustang was a restricted area until 1992, it is one of the most preserved regions in the world. Lo-Manthang is the capital of Upper Mustang. 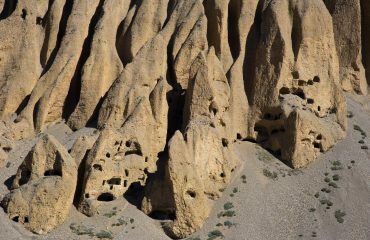 We follow old trails along rugged arid mountains, deep canyons, eroded cliffs and Moraine valleys. 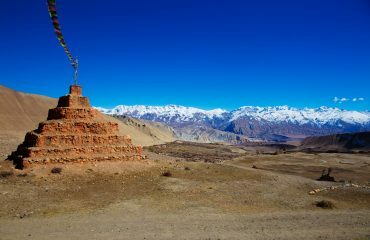 This gateway to Tibetan high passes and the hidden Shangri-La Dolpo also houses several ancient monasteries and the ruins of the palace of the ancient kingdom. 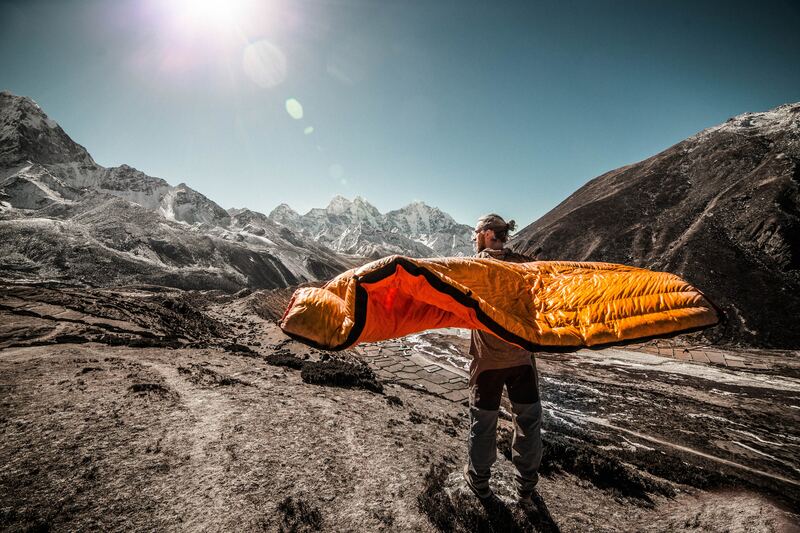 This is an epic journey through the remote and stunning stretches of Nepal. 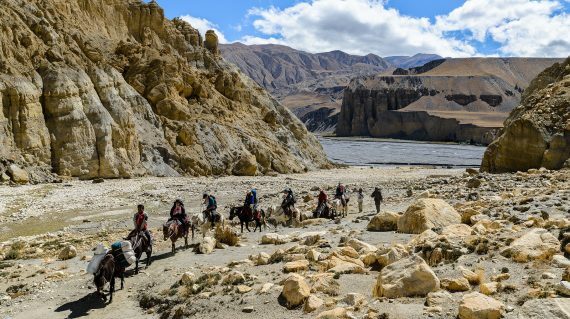 All about the Upper Mustang Trek [Kingdom of Lo]. 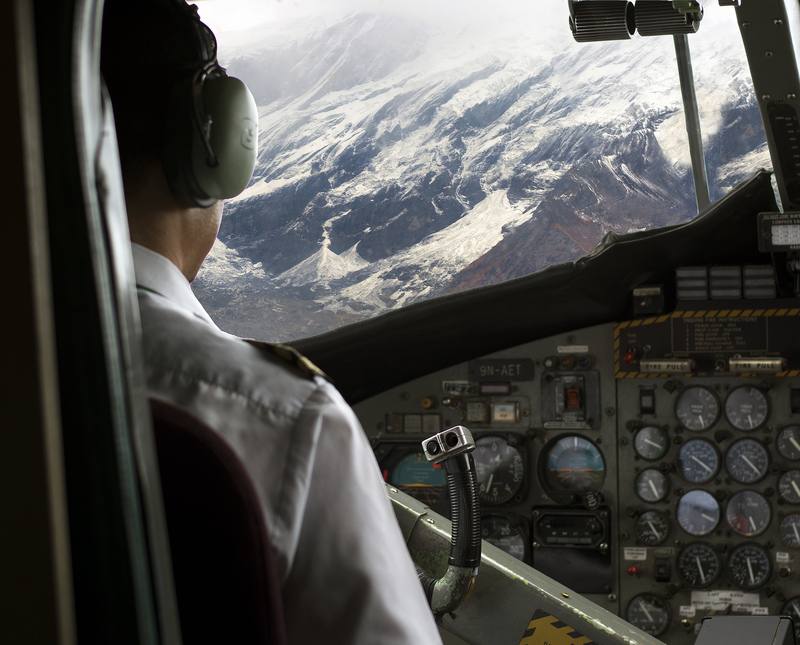 Mustang, the former Kingdom of Lo, is a remote and isolated region of he Nepalese Himalayas. 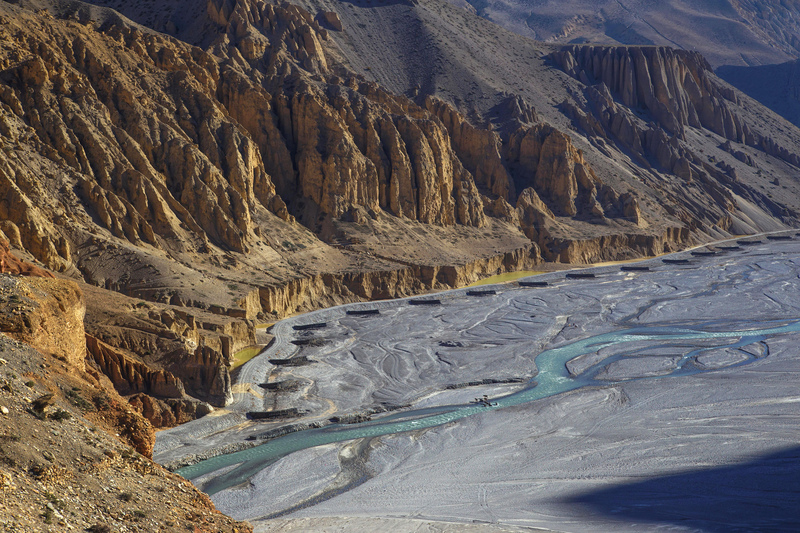 Since Upper Mustang was a restricted area until 1992, it is one of the most preserved regions in the world. However, in 2008 Mustang’s status as a kingdom ended when its suzerain Kingdom of Nepal became a republic. The area is in between stunning landscapes. 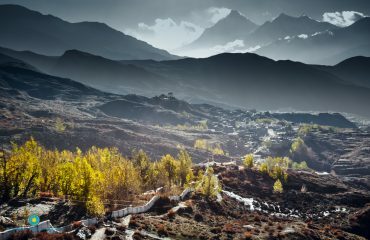 It flanks the Tibetan border in the north and is in the rain shadow of the Annapurna and Dhaulagiri ranges in the south. 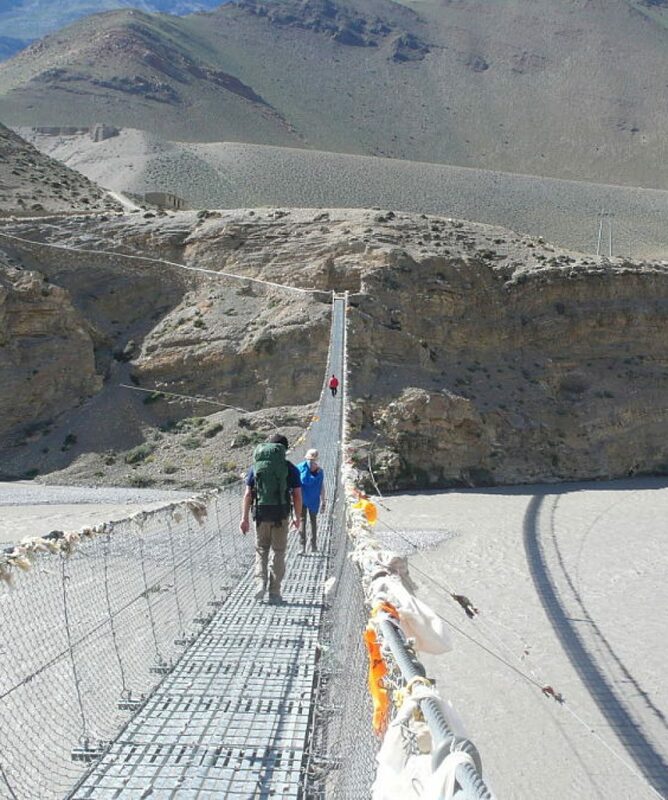 On this trek we go to the walled mountain city of Lo-Manthang, the capital of Upper Mustang. 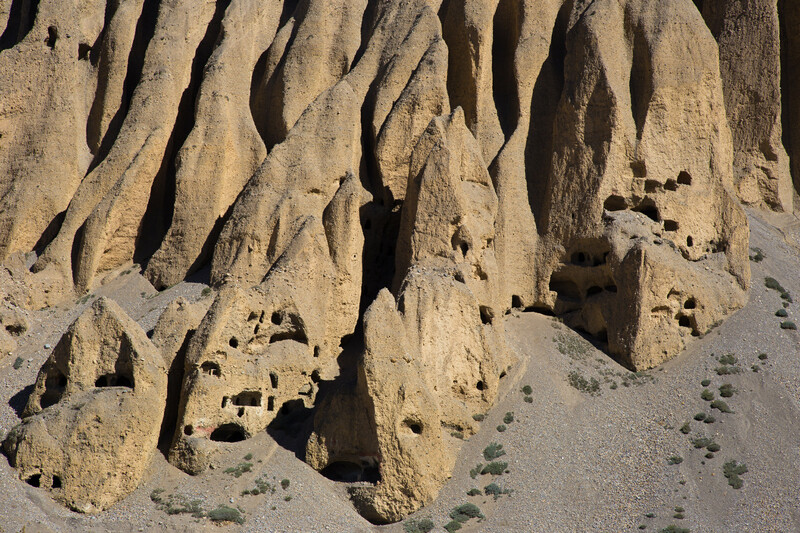 We follow old trails along rugged arid mountains, deep canyons, eroded cliffs and Moraine valleys. This gateway to Tibetan high passes and the hidden Shangri-La Dolpo also houses several ancient monasteries and the ruins of the palace of the ancient kingdom. 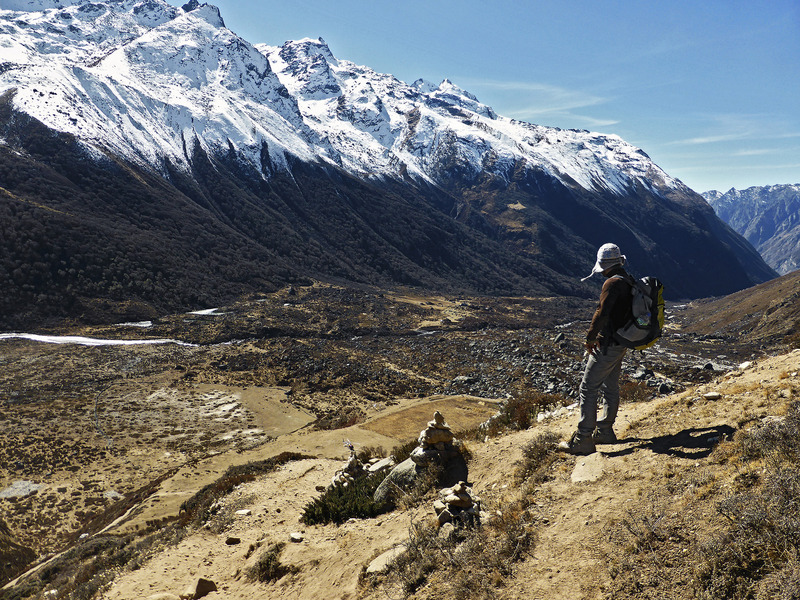 Trekking in this area is just so wonderful that you definitely have a journey of a lifetime. Looking for a shorter trek in Mustang? 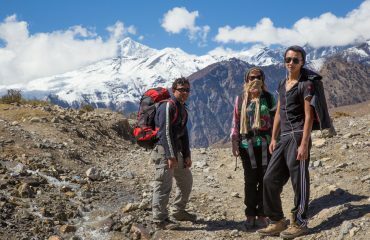 Take a look at our Muktinath Trek in which you’ll trek via a viewpoint with stunning views over the Himalayan range. 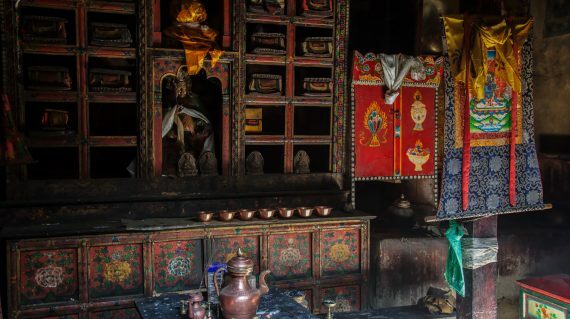 After that you follow the final part of the holy pilgrimage trail to the temples of Muktinath. Early morning at 6:30 am, we pick you up at your hotel and bring you to the bus station. The bus to Pokhara leaves around 7:30 am. Pokhara is located in a beautiful valley on the banks of Fewa Lake. 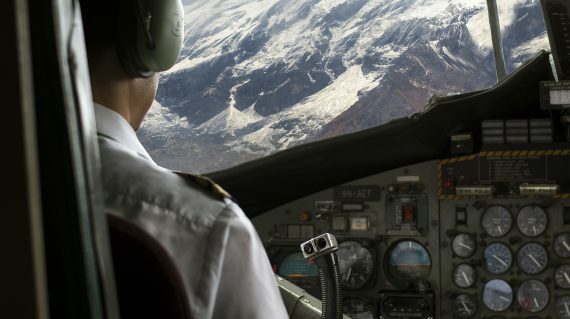 The city is also known for its panoramic views of Annapurna, Machhapuchhre (shape of a fish tail) in the north, Dhaulagiri in the west, Lamjung Himal and Manaslu in the east. Not to mention, Pokhara is smaller and much less hectic than Kathmandu. Today, our trek begins as we board the flight to Jomsom. The flight itself is exciting when the plane flies along the beautiful Annapurna and Dhaulagiri mountain ranges. 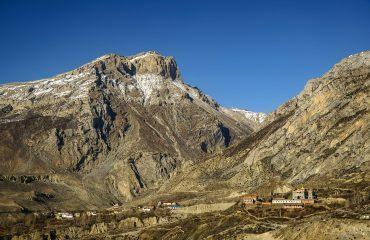 However, the trek officially begins when we arrive in Jomsom and start a short trek to Kagbeni. 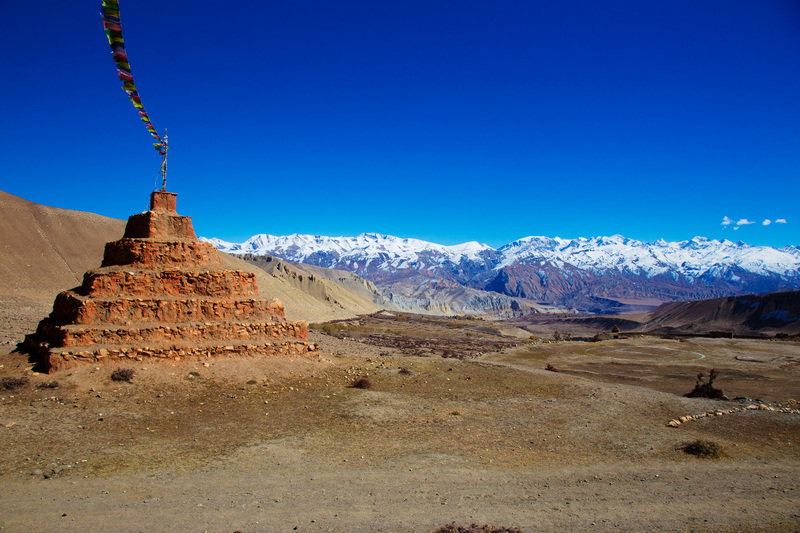 Once we are in Kagbeni (2800m) we are at the main gateway to Upper Mustang. 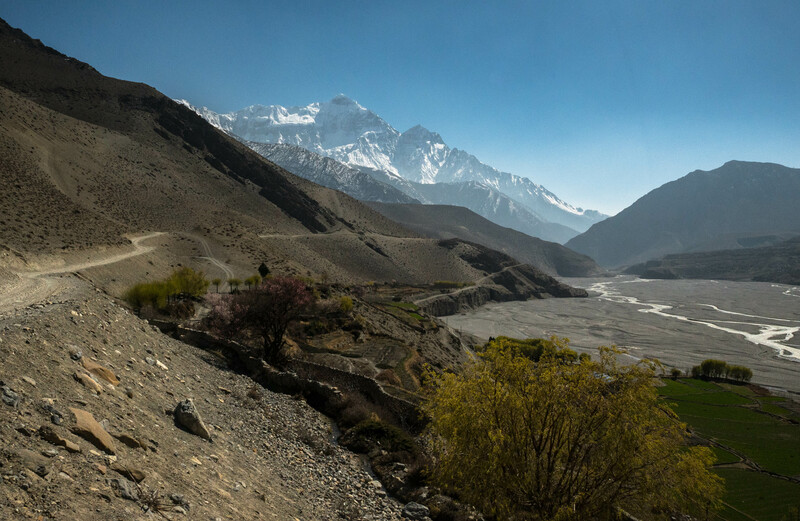 Our day begins with a trail that leads us up towards the east bank of the Kali Gandaki river. In a couple of hours we reach the village of Tangbe. The village is a combination of narrow alleys with white houses, surrounded by buckwheat and barley fields intercepted with apple orchards. The majestic view of the southern skyline of Kagbeni is the Nilgiri peak that accompanies us through the trek. After Tangbe an one and a half hour trek leads us to Chhusang village. From this point we leave the valley of Kali Gandaki behind us and we climb steeply up a rocky gully to the village of Chele. Now the trail becomes more steep with increasing altitude as well. However, it offers us some of the most spectacular views along the way. 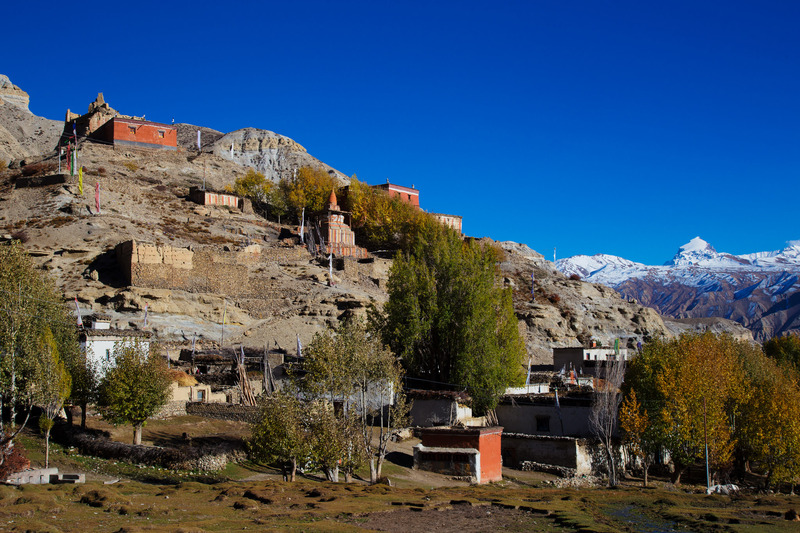 We see the barren land, naked hills, rugged terrain and the enchanting ambiance of Mustang and the adjoining regions. The Annapurna mountain range that is still dominated by Nilgiri, is also visible far to the South. 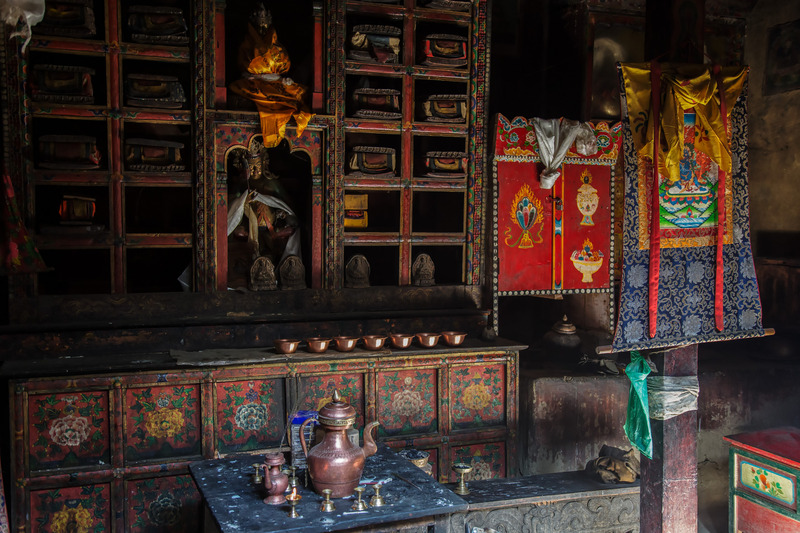 We trek up the Samar village and then a gradual descend leads to Shyangboche. Tonight we sleep in the village of Ghiling. From Ghiling the trail climbs gently up to the pass Nyi La and descend below the blue, gray and red cliffs. Then we climb another pass (3600m) and the trail makes a long and gentle descend to the village of Tsarang. 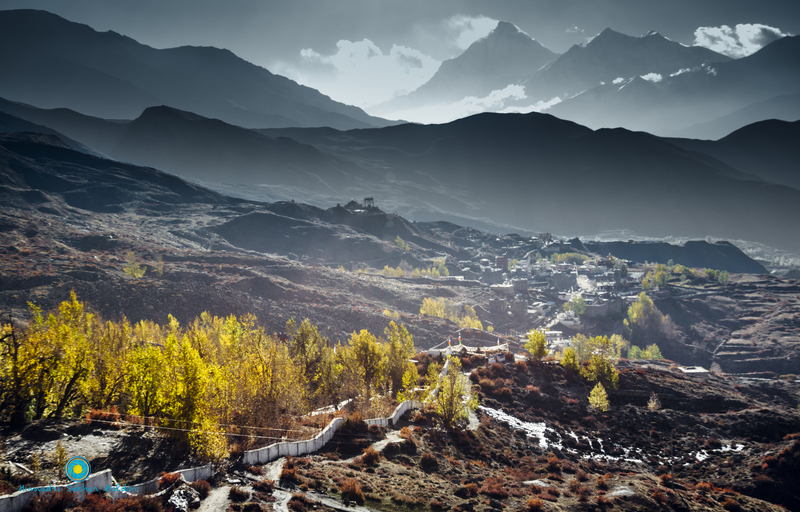 This village has several Tibetan Monasteries which are the source of attraction to Buddhist tourists. 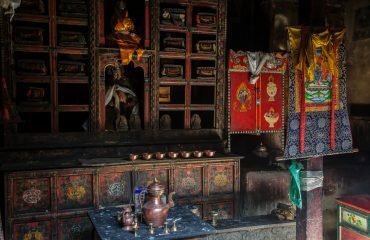 The place is also popular for traditional Thangka’s as well as other kinds of paintings. 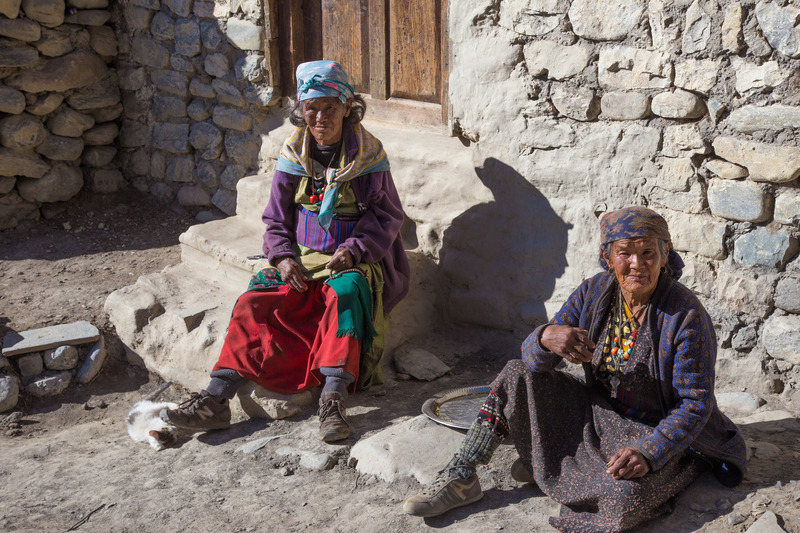 Our trek to Lo-Manthang takes us via two villages. One of them is Lo-Gekar that has a Buddhist Gompa that is older than the Samye Gompa in Tibet. It is considered as one of the oldest Gompas of Nepal. 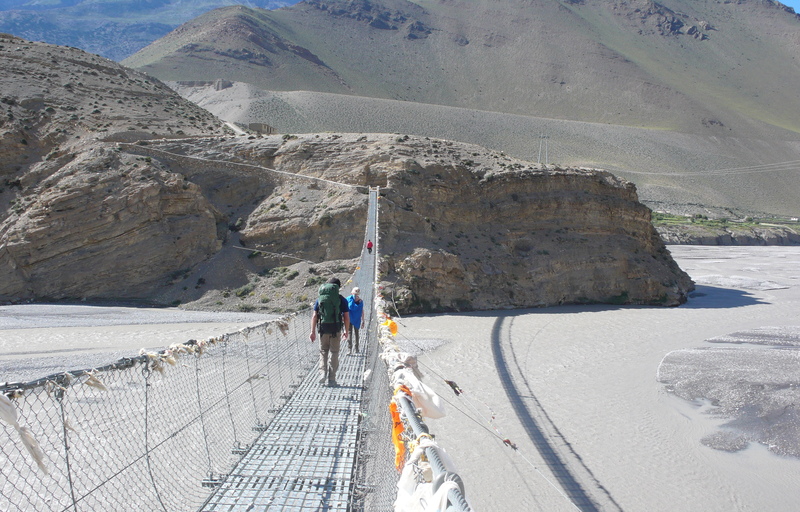 The trek from Lo-Gekar to Lo-Manthang is moderate with some minor climbing. 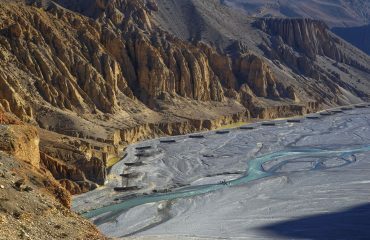 Lo-Manthang is also considered as the Kingdom of Upper Mustang. Tonight we sleep in the same village as where we wake up. However, we go out for some trekking today. 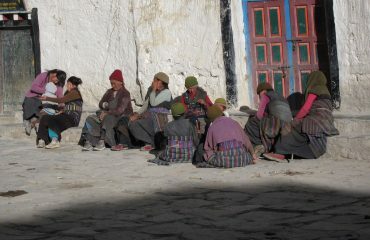 From Lo-Manthang it takes around two hours to reach Namgyal Gompa. 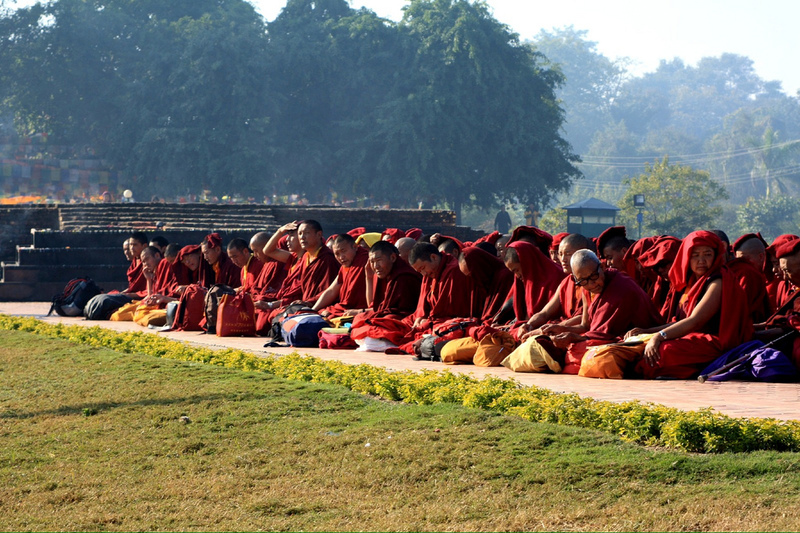 This Gompa is located on the top of a small hill which serves as an important monastery for the local community. Then the trek continues to Tingkhar village which counts around forty houses. After our visit in Namgyal Gompa and Tingkhar we go back to Lo-Manthang. We begin our day with a trek steadily up a ridge (4070m). Then we continue climbing to Chogo La pass (4210m), the highest point on our trek. Then we make a short, steep descend and cross the Charang river to reach Ghar Gompa, a small monastery. From there is left another ridge to climb, a valley to cross and a gradual descend to Drakmar. We begin our day with a descend, passing the stone walls and fields of Drakmar. When we descend further down, we reach Jaite (3820m) and then Chhung-Kah. Then we reach Tama village (3710m) and continue descending until Shyangmochen where we spend the night. From Shyangmochen the trail keeps descending till the trails splits in two. Yet, both trails lead to Chhuksang. Or you follow the second route that passes the village of Samar and Ranchung Cave and takes about 30-minutes extra than the original trail. This is the most noteworthy day of our trek. 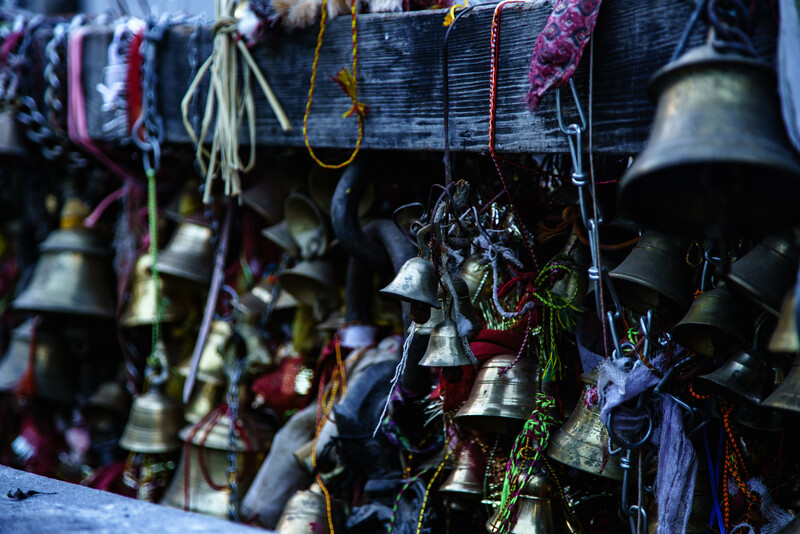 It is a special one as we head to one of the hallowed and sacred pilgrimage destination for Hindu and Buddhist pilgrims: the Muktinath Temple. The trail to Muktinath is attractive as we cross small streams, pass suspension bridges and walk through several villages. 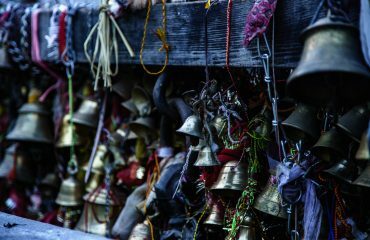 As we wake up Muktinath, one of the most important destinations for Hindus pilgrims, we visit the temple in the morning. 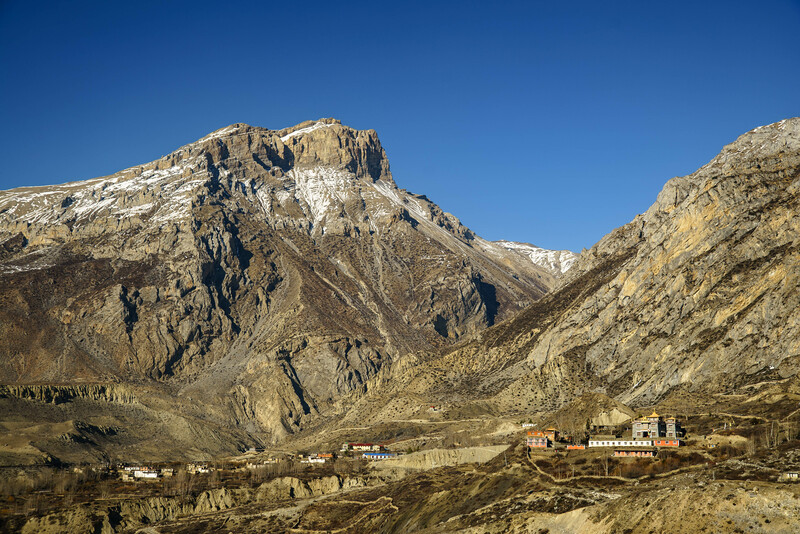 Muktinath is for Hindu pilgrims more commonly known as ”Muktikhsetra” or the region of liberation or salvation. There are 108 water spouts inside the temple premises where people take a holy bath. 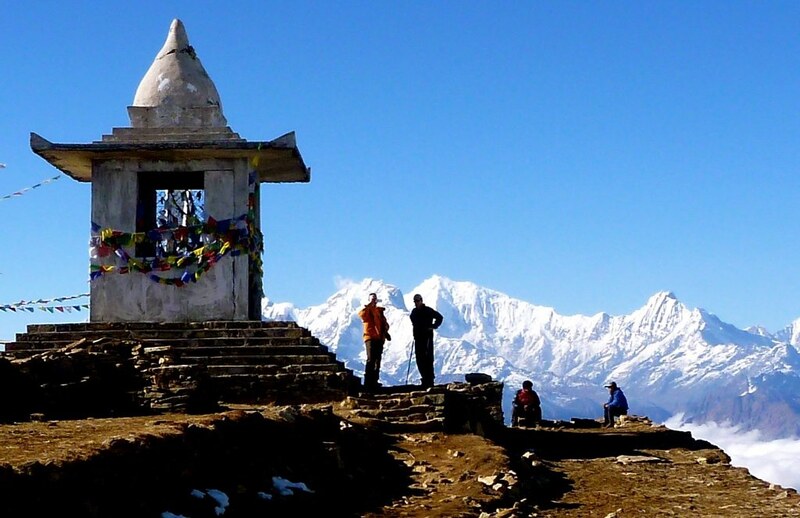 Muktinath also offers magnificent views of Dhaulagiri mountain range. 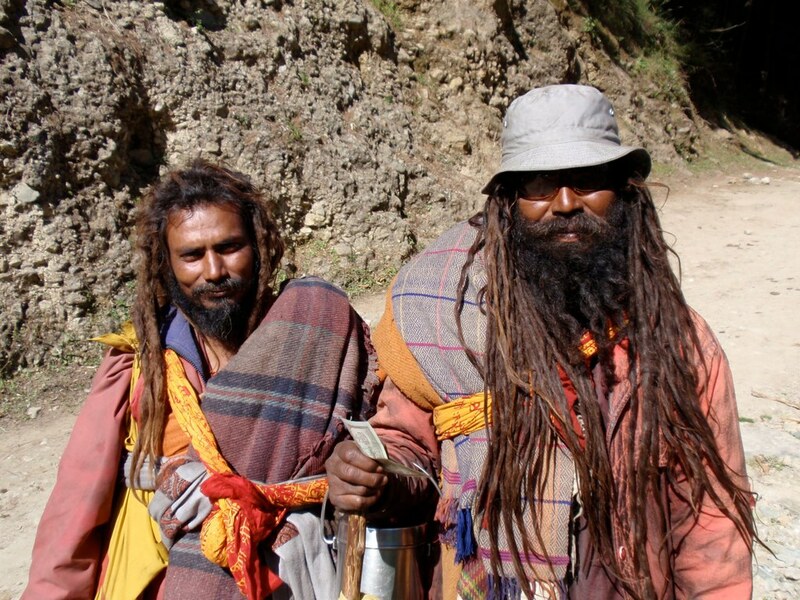 After our visit to the temple, we continue our trek trek downhill. 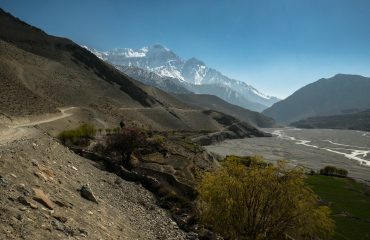 Along the way we come across the valley of the Kali Gandaki river and the village of Kagbeni. This last day of our trek we celebrate in Jomsom along with your trekking staff. In the morning we catch a flight to Pokhara. The rest of the day is free to relax in Lakeside Pokhara or explore the valley. There are wonderful lakes, caves and temples to visit. Also you find night life here, spa’s and fine restaurants. View from Kagbeni by Charlie C.
Enjoying the sun in the streets of Kagbeni by Jean-Marie H.
Trekking in Mustang by Jean-Marie H.
View on the Kali Gandaki river from Chele Jean-Marie H.
Near Lo Gekar by Jean-Marie H.
Drakmar Monastery by Jean-Marie H.
Caves between Chhusang and Tetang in the Narshing Khola gorge by Jean-Marie H.
Near Drakmar by Jean-Marie H.
Bells at Muktinath Temple by Charlie C.
Marc and Kim cross Kali Gandaki by Baukje R.